Whether he is guiding a client, helping an advisor, or designing a new fitness routine to challenge his personal best, Adrian keeps his eyes on the desired goal and strategizes creatively to achieve that end. During his time growing up in Milwaukee, Adrian could usually be found weaving between passing cars with his neighbors while playing street football. He imagined leading his favorite team, the Cleveland Browns, to a Super Bowl Championship. Just before high school, Adrian moved to Lancaster, where he was able to take the many skills he honed amidst the sidewalks in Milwaukee and translate them to a successful “career” as a student-athlete on the grass of numerous high school and college football fields. Although his football cleats have been traded in for jump ropes and kettle bells, Adrian’s success in athletics and other endeavors has been defined by his competitiveness, love of strategy, and ability to improvise. These same attributes have helped craft Adrian into the successful, forward-thinking professional he is today. Adrian serves as a trusted advisor to the clients and staff at Ambassador. Adrian is Ambassador’s Chief Compliance Officer and leader of our planning department, where he spends much of his time helping the team at Ambassador develop and implement estate, charitable and other strategies for clients. As with achieving and maintaining optimal physical fitness, flexibility and creativity to suit the current circumstances is critical. Change is especially prevalent when it comes to tax law, and Adrian relishes the opportunity to employ cutting-edge techniques and, when needed, anticipating change and improvising to create new client solutions. Adrian shares that he feels incredibly blessed to be able to spend nearly every day pursuing his passion of helping individuals, families, and organizations make the most of what God has entrusted to them. In order to maintain his competitive edge in the arena of planning, Adrian is constantly collaborating with other legal and tax professionals, and is a fervent seeker of continuing education. 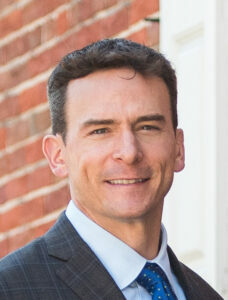 After graduating with honors in International Business and Management from Dickinson College, Adrian went on to complete his Juris Doctor and Masters in Business Administration at Temple University. Since joining Ambassador, Adrian has earned the designation of Chartered Advisor in Philanthropy® and passed the rigorous exam necessary to become a Certified Financial Planner™. During his time at Temple, Adrian’s interests in experiencing new opportunity and learning were given a unique outlet in a summer study abroad program. While studying in Greece, Adrian used his free time to observe the architecture of the Parthenon in Athens, make the short flight to climb the pyramids in Giza, and rub the earth between his hands in the gladiator pits of the Coliseum in Rome. Adrian still enjoys discovering new places, and observing the beauties and solace of the natural world. When asked, What three items would you hope to have if you were stranded on a deserted island? Adrian, an Eagle Scout, admits that he would welcome being stranded, as long as he had his pocket knife, a Bible, and a football (the trees and sea life would have to do for teammates). Amongst the professional groups and affiliations Adrian maintains, he is a member of the International Association of Advisors in Philanthropy, as well as the Lancaster, Pennsylvania, New York, and American Bar Associations. Adrian resides in Lititz with his wife, Julie, and their three children, Olivia, Rowan, and Cadence.